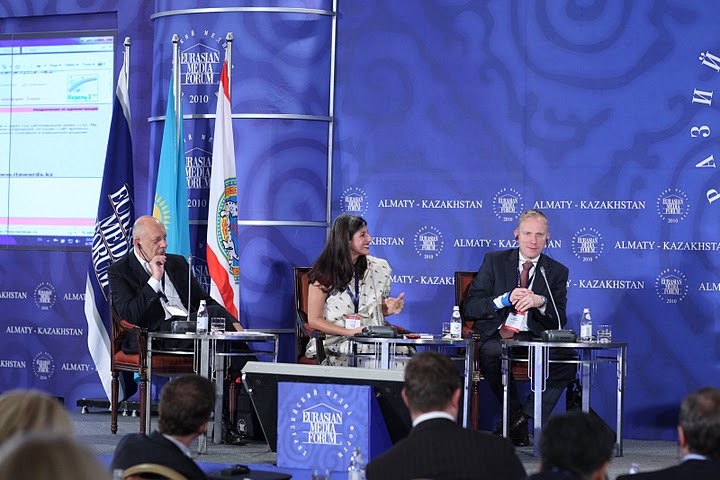 If nothing else, my participation in the Eurasian Media Forum Conference, held in Almaty, Kazakhstan last week, showed me that the debate on the ‘mainstream’ media versus the ‘new’ media is alive all over the world. In fact the World Economic Forum’s Global Agenda Council is traveling across continents to discuss the future of journalism, and whether the only recourse available to shrinking newspapers is to embrace internet content. (And yes, the irony of writing this for a newly embarked newspaper is not escaping me.) The WEF for whom I was a panelist, argue that the profession is ‘no longer the sole preserve of the news professional but now operates in a networked information ecosystem based on public participation and connectivity.’ Anyone who knows me and my work is aware that I am a proponent of what is being called the ‘networked’ media, which is the convergence of the mediums of broadcast and print news with citizen journalism. After all, I wrote a piece called ‘I Heart Twitter’! It turns out that I’m not the only one. My fellow speaker, Turi Munthe of the Demotix website, believes that his novel type of wire service, which is making established news agencies like the Associated Press more than a little nervous, offers a fresh perspective on international news stories. With the platform that he provides, Munthe says that his citizen journalists and freelance reporters in over 170 countries can tell their native stories in their own voices rather than as determined by an editor or as heard by — let’s face it, white people. That to me, a third-worlder, a native of what is now globally recognised (not perceived) as the most dangerous place on earth due to tilted reportage, is the most exciting aspect of citizen journalism. Whether it was Michael Tippett whose participatory news network, NowPublic claims to have on occasion more reporters than news organisations can hope to staff, or Alexander Kuznetsov who highlighted the role of internet flashmobs in Russian politics today, it was clear that web content has changed journalism as we knew it, and will continue to do so. The question that comes to my mind is not whether broadcast and print should turn to internet content as there is scarcely another option, but do the new media want to rescue the old, traditional, mainstream, or whatever name you choose? Last year in Pakistan, the negligence of a medical institution that resulted in the death of a 3-year old girl was brought to public attention with blogs, social media and billboards — a phenomenon never witnessed before. During the original Long March, the use of the SMS made enough of an impact for the current president to ban a certain kind of text. Anything that makes the state sweat sounds good to me. In this country where people are disempowered and the state is corrupt, the new media offer a valuable tool. The argument that citizen journalism or crowd-powered news bestows power in the hands of those who do not know how to handle it sounds a bit hollow to me. I would go so far as to say that I hear a note of fear there. I am not sure if it is having a new EL paper (ET) or just a general gathering of momentum, but I do feel that there is an emerging sense of ‘new journalism’ here in Pakistan. It is diverse, multi-platform, populated by young and not-so-young writers/commentators and willing to accommodate the likes of myself who are not truly of Pakistan but have our homes here. We have the potential to be if not powerful at least influential…and, old fogey that I am, would say that we need to be setting an example to our politicians in that we should use our influence responsibly.